In this video, I sing the lullaby Rock-a-Bye Baby to the ridiculous and precocious infant on my lap. 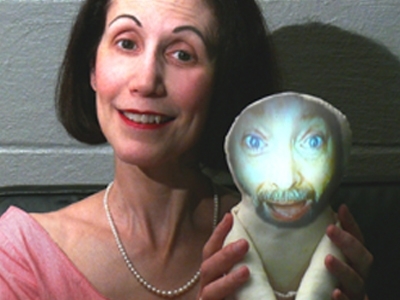 (This little creature is a projected image of Gene Panczenko’s bearded face onto a faceless doll!) Baby Gene cries because he is upset by the lyrics of the lullaby. I find a way to pacify him!